Find answers to frequently asked questions (FAQs) about housing. Just click on a question below to reveal the answer associated with it. Do laws protect the rights of people with disabilities from discrimination in housing? In Illinois, state laws protect the housing rights of people with disabilities. Some Illinois cities and towns also have their own laws regarding housing discrimination. This FAQ focuses on the Fair Housing Act. Who is considered a housing provider under the federal Fair Housing Act? Can a housing provider refuse to rent or sell to a person because of a disability? No. It is illegal for a housing provider to refuse to rent or sell to a person because of a disability. A landlord cannot refuse to rent to a person with a mental illness because other tenants say that makes them uncomfortable. 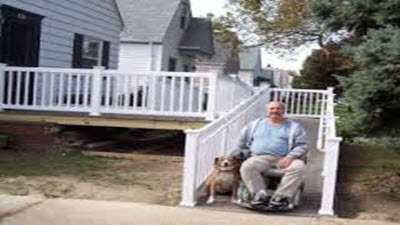 A condominium board cannot refuse to approve the sale of a condominium on a high floor to a person who uses a wheelchair based on safety or insurance concerns. A landlord cannot refuse to rent to a person who uses a service animal based on the building’s “no pet” policy. What questions may a housing provider ask of current or potential residents regarding disability? Are there any situations in which a housing provider can refuse to rent or sell to a person because of a disability? A housing provider may refuse to rent or sell to a person based on disability only if the person’s conduct would pose a direct threat to the health, safety or property of other residents. A determination of a direct threat must be made after an individualized assessment, not based on fear or stereotypes. Before the housing provider can refuse to rent or sell based on a direct threat, the provider must consider whether “reasonable accommodations” could reduce or eliminate the threat. The housing provider must also take into account whether the person’s conduct has improved since the alleged dangerous behavior occurred. Can local governments pass laws to keep people with disabilities from renting or buying property in their area? No. Local governments also may not use zoning policies to keep people with disabilities from living in their area. People with disabilities have the same rights as nondisabled people to live where they choose. Can housing providers impose terms or conditions on people with disabilities that are different from those imposed on nondisabled people? No. A housing provider may not impose on people with disabilities application or qualification standards, rental amounts, sales prices or any other terms that are different from those imposed on nondisabled people. Must housing providers make and pay for “reasonable accommodations” for people with disabilities? Yes. A reasonable accommodation is a change in rules, policies, practices or services to allow people with disabilities equal opportunity to enjoy their homes and the building’s common areas. Must the housing provider anticipate the needs of a resident with a disability, or is it the responsibility of the person with a disability to request a reasonable accommodation? The person with a disability must request the accommodation. The request can be made orally, by email or by letter. However, requests should be made in writing so the resident can prove that the request was made. What kinds of information can the housing provider request when a person with a disability seeks a reasonable accommodation? If the person’s disability is obvious and the need for the accommodation is apparent, then the provider may not request any additional information. For example, if a person who is blind seeks help filling out a rental application, the provider may not request documentation of the existence of the disability or of the need for an accommodation. However, if either the disability or the need for the accommodation is not apparent, the housing provider can ask for documentation. For example, if a person using a wheelchair asks for permission to have a support animal in a “no pets” building, the housing provider may ask for information about why the person needs a dog.